In Leonardo’s opinion, it was not sufficient for the artist to represent the appearance of things. He should also convey how they moved and functioned as living beings. 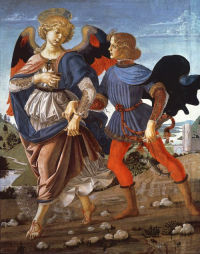 Both the dog and the fish in Tobias and the Angel are thought to be the work of the young Leonardo, and as such are evidence of his approach to painting. The dog’s coat has been rendered with great painterly freedom. The fluffy texture of the coat and the dog’s jaunty pose convey a wonderful sense of movement and vitality. The raised forelock and the turn of its head mimics the pose of the Archangel Raphael perfectly. Both appear to stride forward in unison. The iridescent quality of the fish’s scales and their reflective quality are wonderfully captured. The wriggling body and open-mouth of the fish seem to indicate the life that has barely departed from its body. In a novel concern for naturalistic, narrative detail, Leonardo has also taken care to portray it as bloody to indicate that Tobias has already removed the gall to use as a remedy for restoring his father’s sight. This small panel is typical of the type of painted works produced in the workshop of Andrea del Verrocchio in Florence during the 1470s, which clearly exhibits the work of different artists. The painting is sometimes attributed to Perugino, who was said to have worked in Verrocchio’s workshop and parts such as the dog and the fish are thought to have been painted by Leonardo.